THE VOICE is one of our favorite singing reality competitions because the judges – definitely have a good time and are even quite funny. Tonight, The Voice season 5 will be returning for “The Best of the Blind Auditions.” Carson and the coaches size up the teams and look back at memorable moments from the blind auditions. There was some amazing talent on last week’s episode. In case you missed it, check out our LIVE RECAP — CLICK HERE. On last night’s show it was the final night of blind auditions in Voice-land, and Blake felt like “it’s Christmas morning all over again.” Tensions were a bit high as all four coaches were looking to put the finishing touches on their team rosters. My favorite singer last night was Latin rocking, Irish-bred Chicagoan Michael Lynch, who wowed all of the coaches with an upbeat and energetic version of “Bailamos.” Xtina was so taken by him that she asked for a mic, and the two sing a duet. On tonight’s show THE BEST OF THE BLINDS – Carson Daly (“Last Call with Carson Daly”) hosts a special recap of the blind auditions, showcasing the best and most memorable moments. Coaches Adam Levine, Blake Shelton, CeeLo Green and Christina Aguilera take a look back at their decisions as they head into the battle rounds. Tonight’s The Voice “The Best of the Blind Auditions” is going to be an exciting one, which you won’t want to miss. 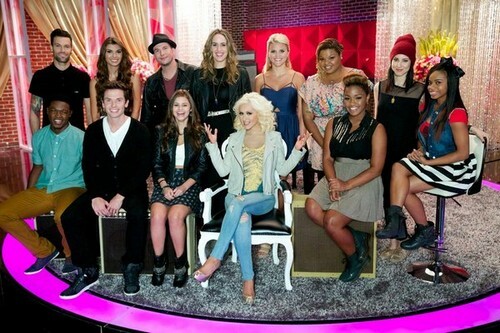 So be sure to tune in for our live coverage of NBC’s The Voice – tonight at 8 PM EST! While you wait for our recap, hit the comments and let us know how excited you are about the new season of The Voice. RECAP: We get a recap of what happened in the auditions and the coaches talk about how amazed they were with the contestants this season and how they are happy to be working with them. We take a look at the performance the coaches did at the beginning of this season; singing a rendition of “I Love Rock N’ Roll”. Adam says he gets very passionate when he hears a singer who reaches into his heart; he tries his best to gain the love them as well with his selling pitches. Adam won many of the 4 chair turns this season as well; he could hardly believe it. We now get a recap of how Adam got all the singers on his team; the way they chose him over the others. We are getting a glimpse into some of the amazing singer from the blind auditions; right now we see more of team Adam amazing the coaches and the audience. We now see Ashley Dubose performing once again and how Adam won her over with his words. Adam mentions how Ashley was stunning and overpowering with her performance; she just took control of the room. Christina says that there is a lot Adam can do with her. Adam believes he has the strongest team ever, he loves how different and versatile they are. We now get a sneak peek at how Adam coached his team; it shows of the match ups that Adam has made with his team for the battle rounds. Adam feels like who ever he drops will be a massive loss for him; he believes they all have a chance at success. We know get a look at Blake’s team, he was looking for diversity and got exactly what he got; he picked singers he would love to hear on the radio. We see a recap of Holly Henry’s performance and how Blake hit his button on the first word she sang. Holly Henry was one of Blake’s four chair turn wins. We then see a recap of E.G. Daily’s performance, she made all the coaches so happy knowing what she did for a career. We get a complication of how Blake was very confident coming in this season; having rubbed in about the fact he’s won the show 3 times in a row. We get more footage of Blake’s team in the blind auditions; this time it’s Shelbie Z who amazed coaches with her powerful voice. We then see Monika Leigh that both Adam and Blake wanted badly but of course Blake pulled out his three trophies for winning three years in a row to get her on his team. We now get a look at Blake coaching his team for the battle round alongside his advisor Cher; he is pairing the singers based on their styles and voices. We know get a look at team CeeLo, Adam calls him the most interesting creature on the planet Earth. CeeLo is completely ready to win this season and Christina says he has a very interesting mind. We get a look at CeeLo winning over 17 year old Caroline Pennell in the blind auditions. Blake could not believe how she didn’t pick him, he really liked her. We now get a look at Kat Robichaud and her energetic performance. We now see Cole Vosbury who impressed CeeLo so much with his performance of the theme song of The Jeffersons; even Adam was so happy to hear it. Adam regretted not turning around for Cole; CeeLo says anyone who does The Jeffersons theme song is someone he must be working with. We now see Jonny Gray and his performance that captivated the coaches with his voice. CeeLo is glad to have him on his team and is confident he can be the winner for his team. We see CeeLo and his friend Miguel helping him with the choices for his battle rounds. Now we take a look at team Christina, Adam believes she put up a great fight this year and was most competitive this year. We see Matthew Schuler who got a turn from ever coach in almost 3 seconds; Christina ultimately won him over to be his coach. Adam felt so bad not having Matthew pick him, he truly believes that Matthew will make it to the end. We now see Olivia Henken’s performance, that got Christina to turn incredibly fast. We know see Christina coaching her team along side Ed Sheeran; she believes he’s super creative and they make a good duo. We take a look at scenes we haven’t seen from the coaches, Christina dances and rubs it in Adam’s face when he loses a lot. They keep bothering Adam as he texts on; they even make really stupid sounds with each other. Blake mentions how his heart pounded the first time seeing Christina, but now it pounds out of fear. We now see the coaches making fun of each other.